Are You Ready for Your Career as an Architectural Drafter? Do those sketches in your notebook count as doodles if they’re developing structural ideas? Do you draw out your ideas on paper or using a computer rather than in words? Architectural drafters provide detailed drawings of planned structures including homes, skyscrapers, football stadiums and everything in between. 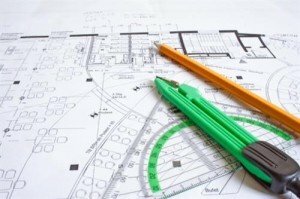 They take an architect or engineer’s concept and turn it into a detailed plan to turn that concept into reality, using computer drafting software. Interested? Read on! Drafters take architectural ideas, concepts and rough plans and use their technical skills to turn them into technical drawings. They add structural details, provide alternative design versions and list specific materials, dimensions and processes required to safely and properly complete construction projects. Full-time employment is the norm, with some amount of overtime being required on occasion. As with most computer-related work, the majority of the work is done in an office environment, though there is some field time spent on construction sites to gather specific information about the project from engineers, architects and surveyors. A basic understanding of CADD (Computer-Aided Drafting and Design), BIM (Building Information Modeling) and PDM (Project Data Management) software packages is vital to the job, as well as some amount of familiarity with computer systems, wide-format printers and similar hardware. Being detail oriented and developing skills in critical thinking, technical areas, time management and interpersonal areas are also very helpful. An associate’s degree in drafting is a minimum requirement, but most firms will look for a bachelor’s degree for architectural drafting due to the complexity involved. An associate’s degree will give you the CADD, drafting and design fundamentals you need before a bachelor’s degree adds strong knowledge in architecture, mathematics and engineering. Most drafters find work after completing a minimum of an associate’s or bachelor’s degree, though some military experience can be combined with additional training in lieu of these requirements in some instances. Certification through the ADDA (American Design Drafting Association) can also prove beneficial as it documents a drafter’s knowledge and understanding of national practices, though it does not cover computer skills necessary to the job. If you want to explore similar career paths to architectural drafting, architects develop building plans, cartographers and photogrammetrists develop maps based on geographic information for a variety of purposes, electrical and electronic engineering technicians assist engineers in developing a variety of electronic systems, electrical engineers develop and design electrical equipment, electrical and electronics installers and repairers see to the installation and repair of electrical devices, an electro-mechanical technician combines electrical and mechanical knowledge, industrial designers develop manufactured product ideas, landscape architects plan and design outdoor space usage such as parks, public trails and airports, mechanical engineering technicians help design and develop mechanical machinery, mechanical engineers design, develop and test mechanical products, surveying and mapping technicians assist surveyors in collecting data to map the earth’s surface, and surveyors establish official boundaries on land, air and water to help develop design documentation. In May 2010, the average annual pay for an architectural drafter was $53,020, somewhat higher than for drafters in other fields, and over half again as high as all U.S. workers on average. Job growth from 2010 to 2020 is expected to be slower than normal at 3%, but as a drafter with above average skill levels on computer systems and software, you should remain competitive as more work in architectural drafting is moved to computer systems. Though construction careers typically have some amount of ups and downs dependent on the economy, increasing population will demand additional residential structures and infrastructure to provide for increased demands on the system.